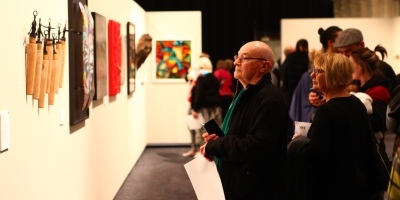 Rotorua Museum, in association with Friends of Rotorua Museum, is delighted to announce that the Rotorua Museum Art Awards will return again this year. These coveted biennial awards were reinstated in 2013 after a 10 year absence and aim to inspire local artists and highlight the wealth of talent in the Bay of Plenty region. Rotorua Museum Operations Manager, Cat Jehly, says the team are excited to see the entries this year, as the quality of artworks has increased each time. “This year sees the largest prize pool of any of the Art Awards with a new Youth Award adding to the line-up. We are incredibly grateful for the backing of our prize sponsors in making this competition possible,” says Ms Jehly. Friends of Rotorua Museum, Toi Ohomai Institute of Technology, Lockwood and More FM have all sponsored prizes this year. This year there is $14,000 in prizes up for grabs: the Rotorua Museum Supreme Award prize of $10,000; the Friends of Rotorua Museum Emerging Artist Award prize of $1,000; the Toi Ohomai Innovation in Art Award prize of $1,000; two More FM People’s Choice Awards of $500 each and the new Lockwood Youth Award prize of $1,000. The Lockwood Youth Award has been introduced to foster a passion in the arts and give confidence to young artists entering competitions. Artists eligible for the Youth Award need to be 18 years or under at time of entry. Entries close on 30 September 2019 and entry details, along with the entry form, are available on Rotorua Museum’s website. Artists will need to deliver completed works by Monday 7 October 2019. Entries close 5pm, Monday 30 September 2019. “The Art Awards are a great way to engage with the local arts community. We had fantastic feedback from all involved last time and can’t wait to see what our talented region produces this year,” says Mr Brown. Local artists who have won previous years Supreme Awards are 2017 Kereama Taepa, 2015 Mandy Hague and 2013 Kylie Tiuka. Sarah Ziessen, who won the Friends of Rotorua Museum Emerging Artist Award in 2013, has gone on to win the National Contemporary Art Award in 2018 with her innovative artwork You and Me, The Weight of History. All awards, except for the More FM People’s Choice Awards, will be announced at a gala awards evening on Tuesday 22 October 2019. Image credit: Visitors view Rotorua Museum Art Awards 2017 Exhibition of Finalists.